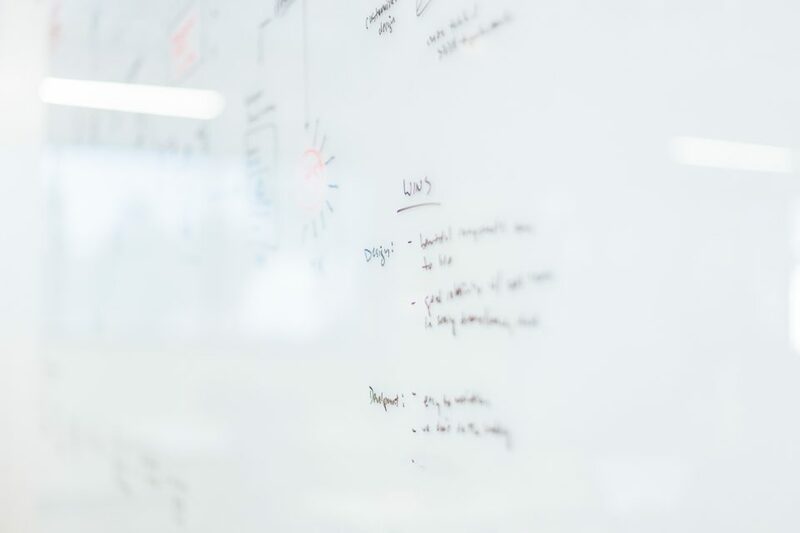 This article is a part of a series called Data-driven agency in which our customers share their approach to measuring & analyzing what’s going on at their company. Do you want to be featured in this series? Drop us a line in the chat. Human resources forecasting is a process of predicting who should be hired in the future (both in terms of skills and manpower) and poses unique challenges for different lines of work. Hiring for the fast-paced digital industry requires talent managers to keep their fingers on the pulse by following emerging technologies & trends. Human resources forecasting for agencies, after all, is aimed at meeting demands of future projects. At its core, however, it’s a process that requires proper understanding of what’s going on at your company. Together with our guests, Piotr and Iwona, I want to show you that resource management software can provide data to deepen this understanding and, as a result, make more confident forecasting choices. 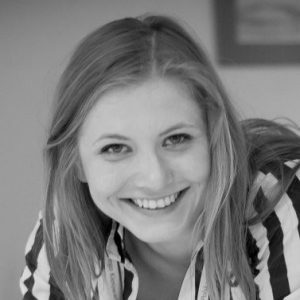 Iwona Marciniak – Office Manager at Le Polish Bureau, the technical department of a renowned production company, UNIT9. 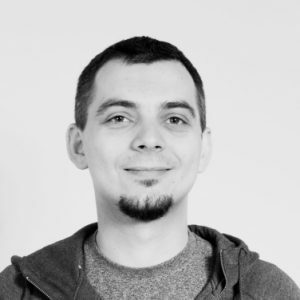 Piotr Bandosz – Head of Finances and People at Apptension, a 50-person creative software house based in Poznań, Poland. Piotr is one of the OG Teamdeck users, having been with the app since its beta launch. No wonder he’s developed a couple of favorites when it comes to automating work and deriving value from the data. One of his go-to reports is a 3-month production forecast. It’s based on the future availability of the team as well as project bookings that have been already assigned. 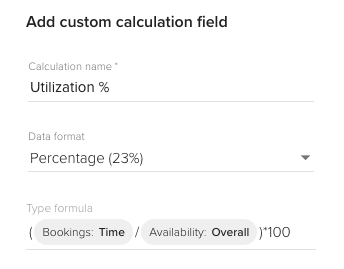 TIP: Use a feature called Add custom calculation field to create the Utilization column. Holding the position of Head of Finance & People, Piotr is able to use this report for both aspects of his job. It gives him a solid overview of Apptension’s planned production pipeline: if the utilization values are lower than expected, he can have a word with the sales team and see whether there’s potential for more deals to be closed in the upcoming weeks. 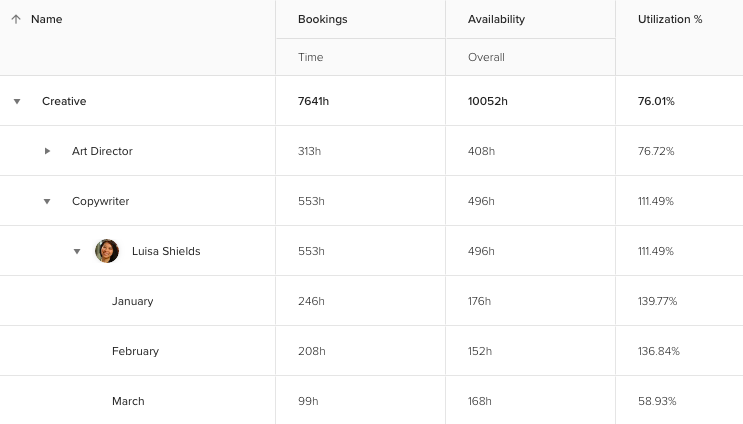 TIP: You can label different kinds of bookings with tags, e.g. “tentative” for bookings that are not yet confirmed but some arrangements have already been made. This simple table is also a good prompt for human resource forecasting. Piotr can analyze the utilization of particular people or departments. This way, he knows which roles will be in high demand shortly, and can plan recruitment processes accordingly. TIP: Custom fields work as tags for projects and people in Teamdeck. They make it easier to sort your data in categories e.g. departments. Both Iwona and Piotr have added a “job title” tag to their teammates in order to filter them by skills. Looking at the table above, you see that even though the Creative department as a whole seems to be reasonably utilized for the upcoming months, drilling the data down shows that we could use some copywriting help, as Luisa has a lot on her plate. The 3-month forecast is also helpful when it comes to assessing whether a given role will be needed for a longer period of time or it’s a short gig better suited for a freelancer. Iwona points out that access to historical data is also extremely useful when trying to optimize future hiring processes. Analyzing data from the past months and years allows to spot trends in data and make more accurate predictions. For example, certain skills turned out to be in higher demand in particular months. Now that the team is able to forecast an upcoming recruitment need, the process can be planned beforehand. If you don’t have enough data to analyze previous years, looking at the recent history can help you too. The historical data report is based on people’s timesheets, and, as Iwona herself admits, “took about 5 minutes to prepare”. Why 168? That’s the average amount of hours in the working month. This number can differ country to country – use the value that makes the most sense in your case. This report is really insightful when you expand the rows and compare the workload per month with the number of people you actually have on board. 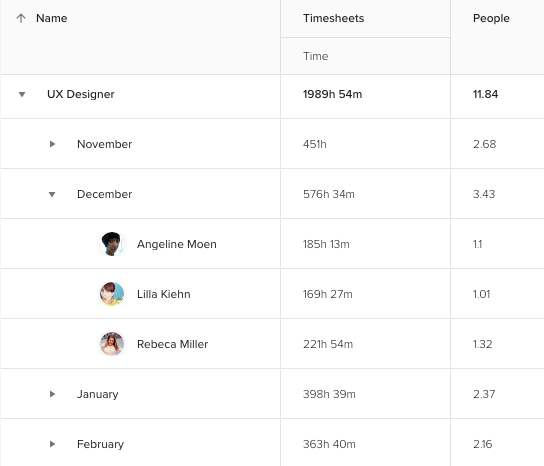 What you see in the picture is a breakdown of timesheets per month of a fictional UX team. There are three people on board, and for most of the time it’s just the right amount to complete the work (the value of the People column doesn’t exceed 3). December, however, seemed to be a very busy for the UX team. 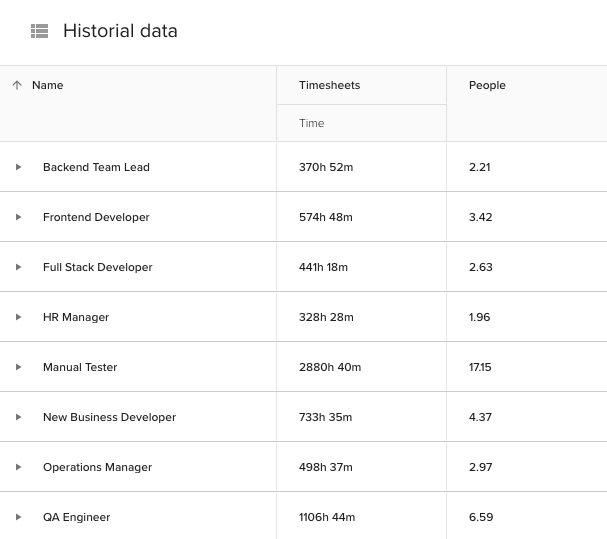 All of the team members have logged more time than usual and the calculation shows that more than 3 people (3.43 actually) would be needed to complete this work within the regular timeframe. It could be the case that this particular December was extraordinarily busy or perhaps it’s an emerging pattern. Anyway, you have every reason to watch the workload of UX designers closely and plan new hires if necessary. 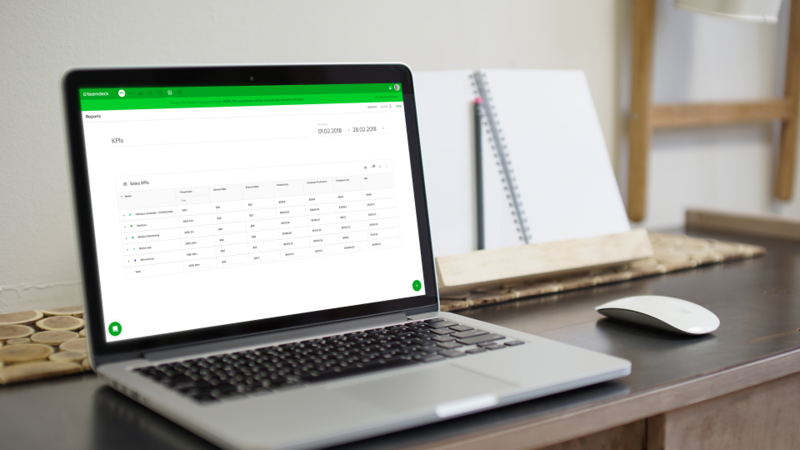 TIP: Timesheet reports are also a great base for calculating the payroll of your employees. There are multiple factors to consider when it comes to planning resource demand at agencies. Things change fast here, both in terms of new projects in the production pipeline and new skills needed to deliver them. You have to make a decision whether you’re looking for people to join your team or contribute to projects as freelancers. Then, of course, there’s the cost of the actual recruitment process. What about the consequences of poorly timed hiring processes? Overstaffed agencies can easily lose their financial liquidity but not having enough resources may jeopardize the upcoming projects or damage carefully crafted client relations. Clearly, there’s a lot at stake here. will help you tremendously. Data-driven human resources forecasting starts with collecting the appropriate insights, preferably in real time. 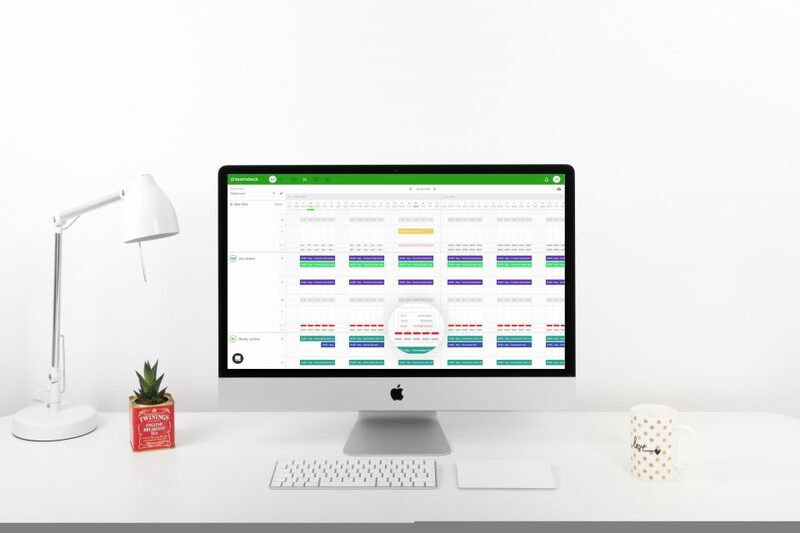 Analytics presented in this article have been captured by Teamdeck, software, that has been tailor-made to support agencies, software houses and startups in resource management. Already have an account? Go to the reports section and create your own analytics dashboard. New to Teamdeck? Setting up an account is free and takes just a couple of minutes. Sign up now!